Roulette is an interesting game of chance with a long history. The game is so amazing that it always gathers crowds of people near the roulette table. The basics of the game are simple for understanding. To play the roulette there must be a roulette wheel and table, dealers and gamblers. The basic element of the roulette game is a wheel. The wheel makes the game the most dynamic game from a big range of casino games. 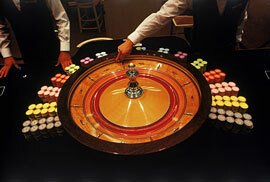 The history of roulette wheel began in the 17th century. In 1655 French mathematician Blaise Pascal created the first form of roulette wheel. As to the type of roulette wheel there are low profile wheels, wheels with special winning number displays. There is a type of roulette wheel called Rapid wheel. It has a slingshot - automatic ball release. Such wheel also has a virtual dealer. Modern wheels have an extremely high level of protection against the roulette cheaters. Who creates the roulette wheels? The first well-known roulette wheel manufacturers are Wills and Caro. Lately such manufacturers as Huxley, Cammegh became popular. Of course, there are other manufacturers too. But these two manufacturers remain till today the only leaders on the market of roulette wheels and there is a constant competition between them.